Continuing the Roadtrip-'62 ™ countdown of US-numbered routes, it’s time to take a peek at highway US-18 today. This east-west highway runs basically through the Great Plains, from Milwaukee, Wisconsin to Orin, Wyoming. The Milwaukee end is in the same city where US-16 once began. Route US-18 is currently 1,043 miles through mostly farm and cattle country on two-lane roads. But it was 88 miles shorter in 1962, before the west end was extended. The extension was made in 1967, and runs US-18 together with US-20 from Mule Creek Junction to Orin, Wyoming. Why it needed an extension when US-20 already covered the same route is anyone’s guess. The Milwaukee end is unusual because it just ends alone, not at a junction with another numbered highway. But we’re looking at beer brewers along US-18, and there is no better place to begin than at Milwaukee. The city’s Major League Baseball team isn’t called the Brewers for nothing! Milwaukee was known as the “Beer Capital of the World” and was home to four of the country’s largest brewers in 1962: Schlitz, Blatz, Miller, and Pabst. The other large-scale brewer with national distribution was Annhauser-Busch, headquartered in St. Louis, Missouri. 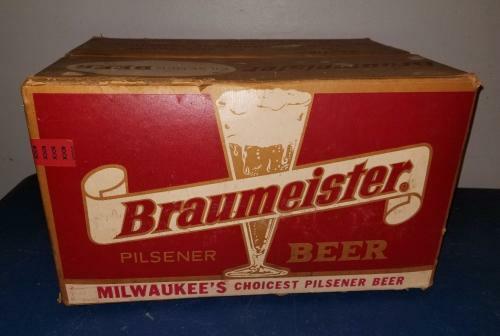 Miller was still growing at the time, having purchased the Milwaukee's Best brand in 1961 when they bought out the local Gettelman Brewing Company. 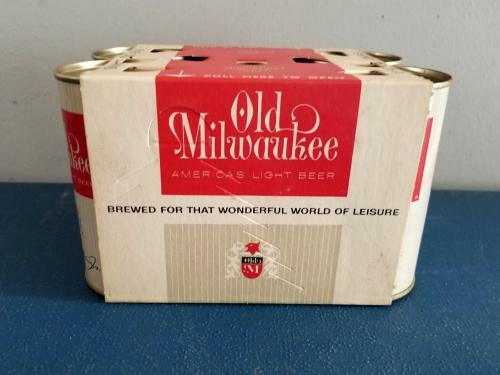 In case you’re wondering about the city’s namesake beer, Old Milwaukee Beer, it was not made by a separate brewery, but was brewed by the Joseph Schlitz Brewing Company. It originated in 1849 and was withdrawn from the market for many years, coming back in 1955. Milwaukee’s beer making history goes back to at least 1844, before the city was even incorporated. That year, Jacob Best opened his brewery, which became the Pabst Brewing Company in 1889. It was renamed after Frederick Pabst, who had married Best’s daughter years earlier, purchased a 50% stake in the company, and later became president. By 1874 Phillip Best Brewing Co. was the nation's largest brewer, and they hadn’t even introduced what would become their best seller, Best Select. The beer was introduced in 1875 and became Pabst Blue Ribbon Beer in a marketing move in the 1890s. It turns out that the beer never actually won a blue ribbon, but during the 1893 World's Fair in Chicago, Pabst had blue ribbons tied around his Best Select so it would stand out from other beers. People began identifying it as the Pabst Blue Ribbon beer and Pabst wisely renamed it to capitalize on the fame. The blue ribbons continued until 1916, when a silk shortage during World War I halted their use. After Prohibition, the blue ribbons around the neck of the bottle returned until 1950. 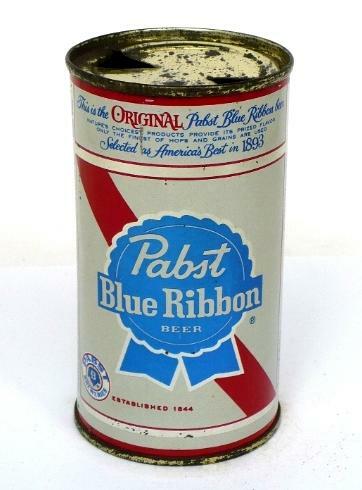 So, we would have missed this gimmick on any Pabst Blue Ribbon we bought in 1962. But we could have tried Pabst’s Andeker, a European-style lager they introduced in 1939. Later in the 1960s it was removed from the market, but we can try it again at the new Pabst Milwaukee Brewery. The Pabst Milwaukee Brewery is not the original brewery, but a brewpub located in an old chapel on the original brewery campus. Today, Pabst Blue Ribbon is brewed by contract at the former flagship brewery of the G. Heileman Brewing Company in La Crosse, Wisconsin. Pabst acquired that in 1996, during a buying spree I’ll discuss later. Since 2014, their original brewhouse in Milwaukee has been converted into a hotel and other buildings on the campus were converted into condominiums and offices. The next oldest brewer in the big four is the Joseph Schlitz Brewing Company, founded in 1849. Joseph Schlitz was hired as a bookkeeper in a tavern brewery owned by August Krug. In 1856, he took over management of the brewery following the death of Krug, married the widow a few years later, and changed the name of the brewery. Schlitz became known as “the beer that made Milwaukee famous” in the aftermath of the terrible Great Chicago Fire in 1871. The fire not only destroyed 11 of the city’s 23 breweries, but also much of its water distribution system and the housing for a third of the population. To help the thirsty Chicagoans, Schlitz floated huge shipments of beer down Lake Michigan. Other Milwaukee brewers also sent beer south, but Schlitz got a lot of the credit, and a lot of the sales afterward. A year before the fire Schlitz produced around 6,800 barrels of beer, but by the end of the year that was doubled. As a result of the huge increase in brewing volume and the experience of long distance shipping, Milwaukee’s brewers soon shipped more beer than those in New York, Philadelphia or St. Louis, despite the larger populations of those cities. Schlitz became the largest beer producer in the country in 1902 and repeated that feat many times, exchanging the title with Anheuser-Busch off-and-on during the 1950s. Schlitz remained the number-two brewery in America as late as 1976, but a series of labor strikes, poor marketing decisions, and a change in the brewing formula nearly killed the brand by 1999. During this period, the company was sold to competitor Stroh Brewery Co. of Detroit, Michigan. The brand has been sold several more times since, resulting in the original Schlitz Beer recipe being lost. You can still buy the beer though, as current owner Miller has researched and reconstructed the classic 1960s formula as best they can, and now brews Schlitz at its Milwaukee production facility. The old Schlitz Brewery complex in Milwaukee was transformed into a mixed-use development called Schlitz Park, with the original Schlitz Brewhouse demolished in 2013. Blatz Beer originated in 1851, at the Milwaukee brewery of Valentin Blatz. He was next door to Johann Braun’s City Brewery and merged the two businesses when Braun died in 1852. In 1875, Blatz was the first Milwaukee brewery to have a bottling department to package beer and ship nationally. It was also the first of the big Milwaukee brewers to disappear, being bought out by Pabst Brewing in 1958. The merger was initially short-lived, because both companies were so big. The federal government sued claiming the merger violated anti-trust laws and it was voided in 1959. So Blatz just closed instead. All the assets were sold the next year…to Pabst, getting around the government’s concerns. The mergers within the beer industry, as noted in the paragraphs above, were especially complicated for Blatz, moving the name through the G. Heileman Brewing Company in 1969, Stroh Brewery Company in 1996, and after a brief stint with Miller Brewing Company, back to Pabst in 2007. Today, Blatz is still produced under contract for Pabst by Miller! The Blatz brewing company's office building in Milwaukee has been converted into condominiums and the former Blatz bottling facility is now the Campus Center Building for the Milwaukee School of Engineering. 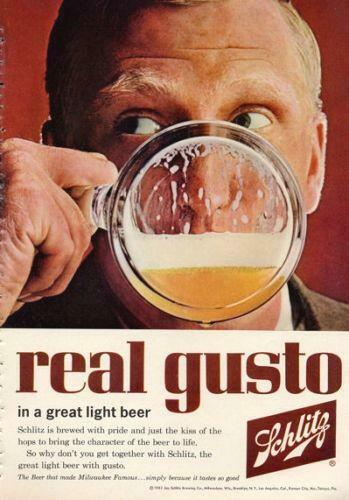 I fondly remember the Blatz jingle from TV ads of the 1962 period, which highlighted the fact that many other beers had a different taste when bottled and canned from how they tasted fresh from the keg, but Blatz was always the same great beer. As the commercial says, "I'm from Milwaukee, and I ought to know! It's Draft Brewed Blatz beer, wherever you go. Smoother, fresher, less filling, that's clear. Blatz is Milwaukee's finest beer!" And finally, we come to the big survivor of Milwaukee beers, Miller. Miller Brewing Company was founded in 1855 by Frederick Miller, who brought a unique brewer’s yeast with him from his native Germany. In 1903, he came up with Miller High Life Beer and packaged it in a Champagne-shaped clear bottle with sloping shoulders. Besides being clear, the bottles also had foil that covered the cap and top of the neck similar to the way Champagne is sold. The nickname “The Champagne of Bottle Beer” was adopted in 1906, which was modified in 1969 to “The Champagne of Beers”, dropping the reference to bottles. By 1955 Miller Brewing had moved up from 20th to 5th in sales nationally. It remained family owned until 1966, when controlling interest was sold to conglomerate W.R.Grace & Company, outbidding PepsiCo. A few years later it was sold to Phillip Morris Inc., but mergers and spinoffs were not over yet. Recently, global giant Anheuser-Busch Inbev wanted to buy the successor company of Phillip Morris, SABMiller, which would have consolidated all major beer production in the country in a single brewer. As part of the 2016 agreement with the US government, Anheuser-Busch Inbev was forced to sell the Miller assets to Molson Coors, where they remain today. So Molson Coors’ Miller Brewing Company is still headquarted in Milwaukee, and you can still get a free, one hour, guided walking tour of the brewery. You will even see the limestone caves where Frederick Miller chilled his beer in the days before refrigeration. And of course, there are ice cold beer samples! How did so much of United States beer history end up in Milwaukee? It seems to have been a fortunate collection of factors. A decade and half after its incorporation in 1846, the city’s population had increased by fivefold, so there were a lot of customers. And by 1880, native Germans made up 27 percent of the city’s population: the highest concentration of a single immigrant group in any American city. With the Germans came beer halls, beer yeast and knowledge of brewing techniques. Also, Milwaukee was close to grain growing areas, which supplied the main ingredient of beer. Being on Lake Michigan, the city also had good water and abundant ice in the days of manual ice harvesting before artificial refrigeration. This stimulated long-distance beer shipping, since rail cars needed to be packed with ice to prevent spoilage en route. Many other cities had some of these qualities, but Milwaukee had them all. And as mentioned earlier, they all came together when Chicago lost almost half its breweries in a fire and Milwaukee brewers stepped into the void. Long distance shipping was the final piece of the puzzle that pushed them to become nationally-minded organizations. And, how did all these beer brewers weather the Prohibition years of 1920-1933, when production and sales of alcoholic beverages was outlawed in the United States? Each company found their own strategy. Pabst switched to cheese production, with their main product being Pabst-ett Cheese. When Prohibition ended, the company sold the cheese line to Kraft. Schlitz made non-alcoholic beverages, changing their slogan to "The drink that made Milwaukee famous." After Prohibition ended, Schlitz quickly became the world's top-selling brewery in 1934. During Prohibition, Blatz produced juices, chewing gum, and non-alcoholic beverages such as sodas, near beer, and the curiously named malt soap. The Miller Brewing Company formed Miller High Life Co. and produced a wide variety of malt syrups, carbonated soft drinks, and cereal beverages during Prohibition. Besides the big four, there were almost no other breweries left in Milwaukee by 1962. During the late 1800s, there were dozens of small breweries here. But most were gone by 1900 and the few that remained died with the beginning of Prohibition. Several were restarted afterward, but by then it was too late to compete with the big boys. 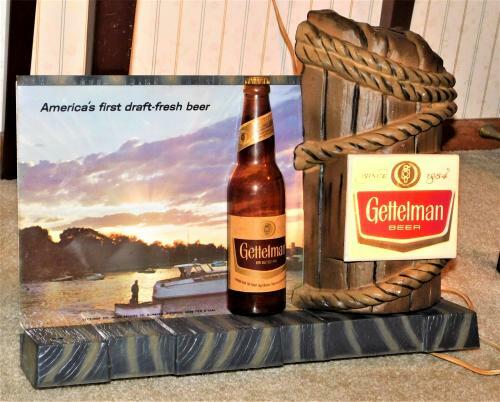 Gettelman Brewing Corp. was the one that lasted the longest. It was originally established in 1895, which was late by Milwaukee standards and may account for why they remained a smaller brewer. As I mentioned earlier, Gettleman’s was purchased by Miller Brewing in 1961. Their best known label was Milwaukee’s Best beer, which continued to be made and sold under Miller’s ownership until 1971. Gettleman’s was an innovator, with Frederick Gettelman personally designing the first practical steel keg in 1933, manufactured by the A.O. Smith Company of Milwaukee. Gettleman’s was also the first American brewer to import and distribute a European beer, importing Tucher beer from Nuremburg, Germany in 1959. I found only one other brewer still in business in 1962, the Independent Milwaukee Brewery. It dated back to 1901, another very late start, and its best-known brand was Braumeister. It closed in 1964, after the company was sold to the larger G. Heileman of La Crosse. Heileman closed the brewery but continued making Braumeister for some time before selling it to the Peter Hand Brewing Co. of Chicago. Hand continued making and selling Braumeister until 1998. You might well wonder whether there are many brewers to find west of Milwaukee along US-18. The short answer is no. There were certainly brewers all across Wisconsin, but most remained small up to Prohibition. As a consequence, many went out of business in 1920 and never came back. A handful tried to restart operations but were swallowed by larger brewers or went out of business as Milwaukee and other big city brewers ramped up regional and national advertising and distribution. The Weber Waukesha Brewing Company, in nearby Waukesha, Wisconsin, began in 1857 and operated under a number of names. Waukesha is only about 20 miles from downtown Milwaukee, so this company and Fox Head, mentioned below, may have enjoyed some of the same benefits that the big four had, or may have been able to imitate them for some time. 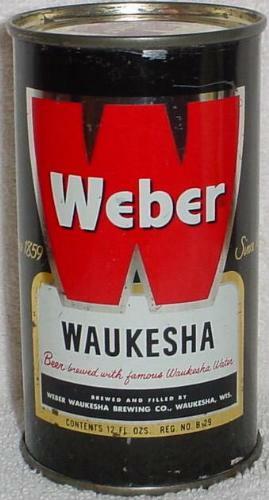 During Prohibition, the Weber Waukesha Brewing Company operated as the Waukesha Dairy Company. When they reopened as a brewery after Prohibition, they completely modernized their plant, becoming the first brewery in the area to use stainless steel equipment. Weber merged with its neighbor Fox Head in 1958. The buildings have since been reused for other purposes and there is a historical marker commemorating the Weber Brewery on US-18 at the intersection with NW Barstow Street. But we could have enjoyed the products of Fox Head in 1962! This brewery began in 1893 when a group of saloon owners from Chicago constructed it as a cooperative to supply their businesses. They chose Waukesha because its spring water was full of minerals and the area had been a popular health resort for some time. They also bottled and sold the spring water and used it for soft drinks, creating a ginger ale named Fox Head in 1908, which soon became the company name. Because of the Chicago connection, after Prohibition ended and the company restarted operations, there were always rumors of mob influence. Some poor business decisions in the 1950s, as the company tried to expand, finally doomed it. Fox Head bottled its last bottle of beer on June 30th, 1962. 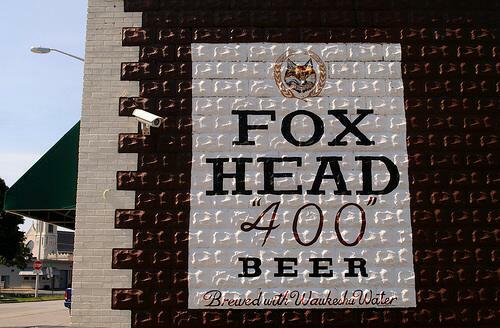 In 2015, a new Fox Head Brewing was opened, using the old trademarks. It is a true microbrewer though, making hand-crafted beers 30 gallons at a time. Jefferson, Wisconsin had several breweries in the 1800s and up to Prohibition, but none that lasted to 1962. The closest was the Henry Perplies Brewing Co., which closed in 1953. Even the much larger city of Madison, Wisconsin’s capital, had only one brewer that made it to 1962. Fauerbach Brewing Co. began in 1868 had its own icehouse on the shores of Lake Monona until 1917. Madison harvested and sold ice far and wide before refrigeration equipment was available, shipping ice by rail to customers. Fauerbach had their own harvesting crew to supply their needs. During prohibition they produced cereal beverages, sodas, and cheeses. Of the several breweries in Madison, only the Fauerbach Brewery started brewing again after Prohibition. They expanded distribution by shipping west by railroad to Minnesota, North Dakota, South Dakota, and Nebraska. But they also had a difficult time competing against the larger national brands. The Fauerbach Brewery closed in 1966, as even the company’s Pepsi bottling franchise could not save them. The brewery was demolished in 1967 and condominiums were built on the site. The Fauerbach beer brand was briefly resurrected in 2005 by family members using a contract brewer, but closed again in 2009. 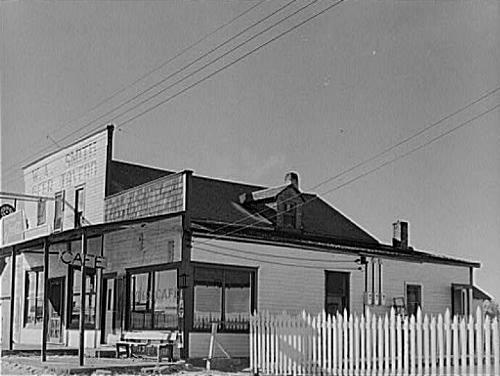 Breweries in Dodgeville, Wisconsin and Prairie du Chien, Wisconsin never reopened after Prohibition. And breweries along US-18 in Iowa never made it to the 20th century at all! There were brewers in Postville, New Hampton, Charles City, Algona, and Mason City in the 1880s. Today, all I can find are a number of recent micro-breweries along US-18, in cities including Mason City, Clear Lake, and Spencer. And when researching this article, I did not find any historical breweries along US-18 in South Dakota. That turned out not to be a surprise once I discovered that about ¾ of US-18 in the state passes through Native American Reservations: the Yankton Sioux Indian Reservation, the Rosebud Indian Reservation, and the Pine Ridge Indian Reservation. A law passed in Congress in 1832 banned the sale of alcohol to Native Americans. The ban was only ended in 1953, giving Native American tribes the option of permitting or banning alcohol sales and consumption on their lands. So there was simply no opportunity to establish breweries. The Pine Ridge Indian Reservation is now the only reservation in South Dakota where the sale and possession of alcohol is still illegal. The tribe has had significant problems with alcohol consumption throughout their history, and that is likely led to their maintaining a “dry” status. The Pine Ridge Reservation covers three counties and they are among the poorest in the United States. It is home to 20,000 Oglala Lakota Sioux tribe members in an area larger than Delaware and Rhode Island combined. The unemployment rate hovers around 80% and the suicide rate is over four times the national average! Per capita income for American Indians living on Pine Ridge is $7,773 versus the United States average of $27,599. It is against this background that the tribe has fought against alcohol sales for over a century and a half. Most recently, the fight went to the Nebraska Supreme Court, which in 2017 upheld a decision of the Nebraska State Liquor Commission revoking the liquor licenses of four businesses just across the state line in the settlement of Whiteclay, Nebraska. Despite the small population of the reservation, over four million cans of beer per year were sold in Whiteclay, mostly to tribal members. The existence of the stores dates back to 1904, when President Theodore Roosevelt reduced the “dry” zone adjacent to the reservation to a single mile radius. This came at a time when the 1890 massacre at Wounded Knee, where up to 300 Lakota on the reservation were killed by the US Army, was still a fresh memory and may have set a pattern of poverty and attitude that has persisted to the present day. Unfortunately, since the closure of the Whiteclay stores, tribal members have begun foraging farther from home, bringing large quantities of alcoholic beverages onto the reservation for illegal bootleg sales. And there has been a surge in methamphetamine abuse, begging the question of whether drugs will simply replace the alcohol. We would have seen the poverty problem back in 1962, but today we might see some wind turbines as we drive US-18 through the reservations. Six South Dakota Sioux tribes are currently working to improve their future with development of utility-scale wind power in a project funded by a multi-Tribal power authority. They are hoping that income from the sale of electrical power will also power their future. I found no record of any breweries on the remainder of US-18 in South Dakota and the route ended less than 10 miles into Wyoming in 1962, so we’ve come to the end of our road. If you haven’t had enough beer history yet, I suggest stopping at The Museum of Beer & Brewing back at the start of our trip in Milwaukee. The Milwaukee County Historical Society has brewing exhibit that they recently moved into The Shops of Grand Avenue, an urban shopping plaza in the heart of town, opened in 1982 in a former hotel building. The Museum is at the main entrance. You can now view the history of brewing in Milwaukee while you shop. And as a bonus, the admission fee includes a beer at the Milwaukee Beer Bar inside the mall! Only Braumeister, Weber Waukesha Beer, and Fauerbach are no longer available anywhere. I’m not much of a beer drinker, so I haven’t tried any of the beers mentioned except for Miller. And that was so long ago that I can’t give any recommendation as to taste. So, I’ll be your designated driver on the next Roadtrip-'62 ™ journey and see you then! This page dedicated to my late friend, colleague, and mentor Dave VanHine. Dave was a beer can collector who loved rummaging around in old barns for unique finds.